I have friends that boulder non-stop; even after getting injured. When a finger is tweaked or a leg hurt the zinc oxide tape is wrapped around the finger or limb for tendon or muscle support and climbing continues. When they chat they talk about bouldering; when they take a photograph it involves a boulder, someone climbing or a new sector of boulders as subject. It’s a random fetish, climbing up free-standing rocks without a T-shirt and the more I think about it from the ‘third person perspective’ the more odd it seems. But then people remind me that I’m weird because I love catching carp on fly. 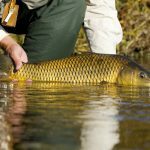 I thought about that too, but from a personal view and if I was forced to choose one freshwater fish to catch for the rest of my life it would be carp…Weird! Or is it? 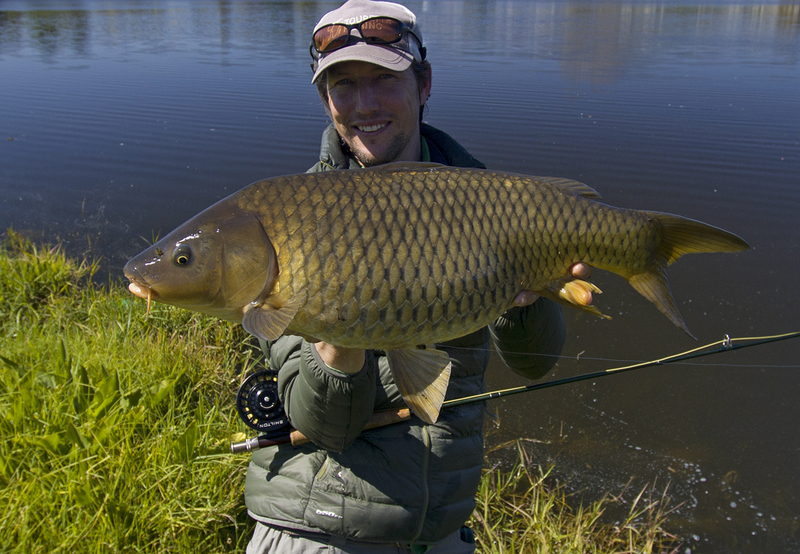 To justify my carp addiction I tried to pin down why I enjoy catching these fish so much on fly tackle. I’ve come to the conclusion that I favour carp above everything else because they beat, fins down, every freshwater fish I’ve caught so far with the way they fight. 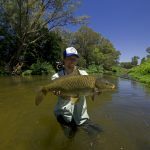 Carp and especially big carp (yes they grow lekker big and also bigger than most freshwater fish in South Africa) can run very far and they tire your arms due to the weight you pull over long periods as they slog it out to the end (I’ve struggled over an hour with big fish on light tackle). 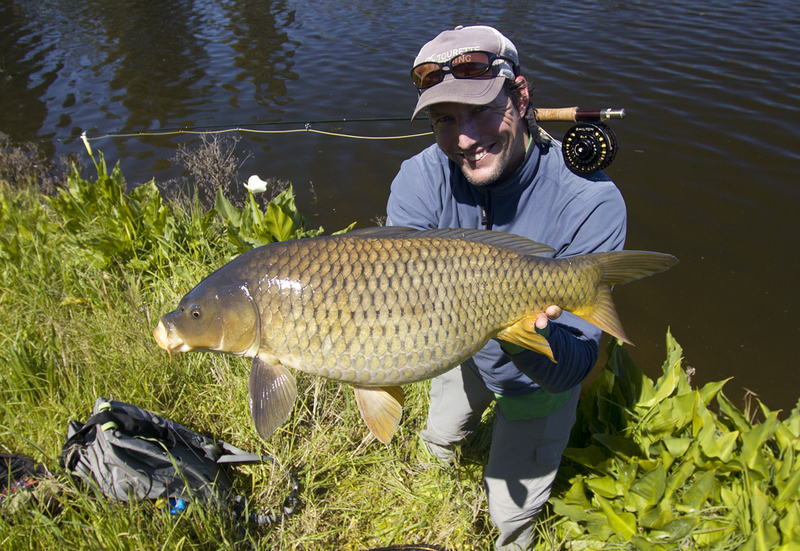 Then carp can be technically very demanding. It’s an intelligent fish that spooks easily and especially Western Cape carp are fly and tippet shy, mostly only eating #12-14 flies on 3X fluorocarbon tippet. Hence the long fights. 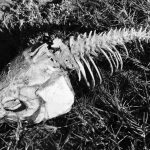 Tell me about a freshwater fish in our country that beats that, eh? 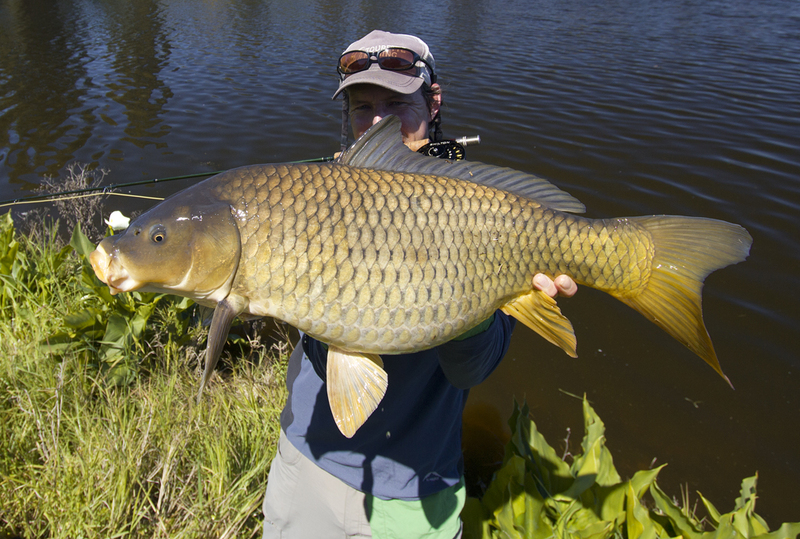 Actually, I was recently pleasantly reminded about the pickiness and strength of big carp. I was fishing for schooling fish cruising near the surface and they refused every fly offering until after about an hour’s frustration I carefully picked a tiny, drab, heavily hackled black Zulu from my box. It was an old fly that I tied while experimenting with different hook types for carp, as fish mostly opened standard, short shank fly hooks, #12 and smaller. The next suspending carp that saw the fly twitch past its nose lunged forward and gulped it down. The second fish sipped it gently and then nearly spooled my reel. Then I had to head off to make a meeting in time. After refusing all the flies I chucked at them for over an hour, a fish finally sucked another pattern in so deep that I needed forceps to remove the hook from its gullet. The fly had the perfect sink rate and profile to grab their interest. This I’ve noticed may differ every time I go after them, even at different times of the day. So I guess what I’m trying to tell you, besides the fact that carp are cool, is by playing with hook wire thickness and the number of hackle turns you add (or don’t add) to your flies could make a big difference on the day and time of day.